Navigation-Instructions in GPX-Format (BRouter-Interface) ? I'm working on providing map-based voice-hints from BRouter in order to have a more precice voice-guiding. My understanding is that I can simply carry them along with the GPX, either imported explicitly into Locus or requested via BRouter's aidl-interface. Howver, I failed to get any vital sign from Locus actually using my hints. as well as a version with locus specific extensios ( <extensions><locus:rtePointAction> ...), but with no success. Any hint what I have to write into the GPX in order to hear my own voice-hints while navigating with Locus? Re: Navigation-Instructions in GPX-Format (BRouter-Interface) ? 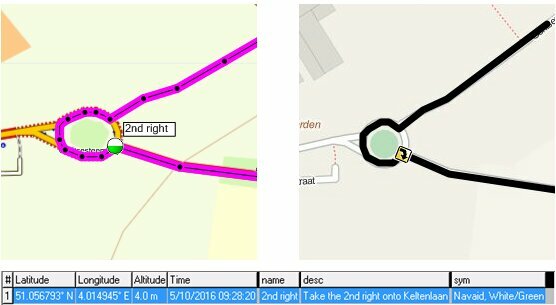 I think that best option is to create really simple track in Locus with some navigation commands and then export it into GPX file. You may then check difference compare to you own solution. Anyway solution with <extension> should work after import in all cases. Also you may attach any file that do not work here and I'll tell you where is a problem. Anyway solution with <extension> should work after import in all cases. Everything fine, I am hearing MY waypóints in MY lamnguage - perfect. However, it does not work when I initiate the GPX-calculation via Locus. When I select the "calculate instruictions" checkbox, I hear the locus-generated waypoints, and when I do not select it, I get nother type of display (guiding?) amd yet another style of voice messages, which are also no my ones. Can you confirm that you always ignore the waypoints when reading a GPX from BRouter's AIDL-Interface? It there a quick solution or do we need a software change? also from a post in a discussion group, may I understand that you are a part of development team behind BRouter and wants to extend it? Finally . So as I read, main problem is format, how to exchange some data, right? My opinion is, that BRouter should be the one, who define format. Other apps may use it if wants. So I see some option like "export for OsmAnd, export for Locus, ..." quite crazy. Also there is no universal format for this task. TCX format may include some instructions, but is quite limited = useless. GPX by default do not have any extension for this case. So I really suggest to create own extension to GPX format with all information you may provide. I'll gladly, as well as other app developers, adapt it to own applications. Anyway if you will wants to use format I use in Locus, less work for me, anyway it's not clear solution I think. Locus is app who wants something, so it should adapt to BRouter format, not opposite (in this case of course, when we do not have any universal format). About "ignoring waypoints". It is quite possible. Locus by default do not merge them into track. If you may provide me some beta version, I'll fix it of course. Let me know ... I'm here at your service! EDIT: ehm, sorry. I finally looked on your name Arndt. I'm sorry, we already talked about BRouter long time ago, so I didn't recognized you immediately. Menion, wouldn't the format of data which Graphhopper exchanges with Locus perfectly match the needs for integration of BRouter? I do not know what format are you talking about. GraphHopper add-on use Java objects (classes) for exchange, not any readable format. Well then these Java objects are the "data format" which are used to exchange information. But maybe you are in direct contact with Arndt and have already found a solution with him. Arndt has mentioned in Brouter Google group idea of advanced hints info in the GPX comments. Anyway if you will wants to use format I use in Locus, less work for me, anyway it's not clear solution I think. sorry for the long delay, but here's what I came up with. After careful consideration, I decided to go with the native turn-instruction formats used by Locus and OsmAnd. - when creating a GPX via the BRouter app, nothing special to do. The profiles are configured to "turnInstructionMode = 1 = auto, which means it generates Locus format when using a Locus waypoint-database. - evaluate the locus extensions containing the turn-instructions the same way you do it when importing with "merge waypoints into track"
the first instruction after a roundabout that is not a roundabout is announced as the last roundabouts exit count ("third exit") instead of the actual next instruction ("turn left"). - second issue are roundabouts. You use method where is only a single navigation command at start of roundabout. For this is needed to include "Simple roundabout" parameter to track. This may be done by two options. 3. my recommended solution ... this about option to place also second waypoint on place where user should exit the roundabout. In case of huge rounabout, this second command has also a send as Locus then correctly inform about place where to really exit. So I suggest to make solution no. 1 as soon as possible and later think about 3. option. I test-drived it and it really solves my issue with roundabout-announcements. I will look at the extended roundabout announcements later. I will upload version 1.4.1 to google play shortly if I do not get any alarms. I have one more questions for You if possible. Can you imagine, that request over AIDL should contains also a name of file with "profile"? Because I can imagine UI selection of profile directly in Locus. There is a lot of people who make a nice profiles and with this improvements (generated commands), I'm more and more thinking how to get your tool to people in some "more usable form". Or is this a total nonsense and you need to map profiles only over app itself (or file)? I have one more questions for You if possible. Can you imagine, that request over AIDL should contains also a name of file with "profile"? Because I can imagine UI selection of profile directly in Locus. I would not favor an API that sends net data of profile directly (or absolute path to it somewhere on sd-card), because the tight coupling between brouter software and profile would raise compatibilty issues. Nono, it's not needed to next release. It will take also some time on my side, so no hurry. For me, it's not a problem to accept whatever method will be best for you. Request on all profiles and name of profile, or just name of profile that Locus get directly from brouter/profile directory, or maybe a full content of profile file as parameter ( which should be most useful from my point of view as it may allow to include some special profiles directly into app/assets and send them just over AIDL). But what is and what isn't possible, you know it. Thanks for consideration! Info: Roundabout by mapsource openfietsmap.